THE MOST ADVANCED SPACE COMBAT CAPITAL SHIP SIMULATOR. EVER. SERIOUSLY. In Feb 2015, as part of the Battlecruiser twenty-five year anniversary celebration, a refresh of Universal Combat v2.0 was released for FREE for a limited time. Universal Combat which was first released in 2004, was the spiritual successor to the legendary Battlecruiser 3000AD series of games which made its debut in 1996. Then heralded as the most advanced capital ship space combat game, Battlecruiser 3000AD, the first title in the series, set the resulting standard for high-end capital ship combat games. You not only had control over a massive armed carrier in a vast universe with space and planetary bodies, you also had complete control over the carrier's systems (weapons, navigation etc), support crafts (fighters, shuttles, vehicles) as well as an entire crew that moved around the ship doing various things (e.g. engaging in combat with intruders). 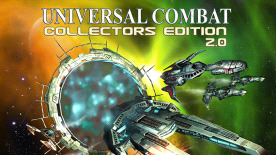 In 2007, Universal Combat Collectors Edition was released as the final title in the Battlecruiser and Universal Combat IPs. In 2009, following the 2008 release of Galactic Command Echo Squad SE which had improved space and planetary engines, we again refreshed the Universal Combat CE game with those improved engines, then later released it as Universal Combat Collector's Edition v2.0. Here is a sampling of the game features, out of hundreds of things that you can do in the game; most of which you can must make up as you go along. And this list doesn't contain any mention of the advanced game engine technologies, especially one of the most advanced AI systems you've ever encountered in a game. Command 28 capital ships including carriers, cruisers, transports. Command 46 support crafts including fighters, shuttles and planetary vehicles. Command a crew of over 100 personnel including key personnel such a Flight Officer, Navigation Officer etc. Use fleet command & control to create a massive fleet consisting of your ships and other AI controlled ones. Direct control of various ship systems including shields, reactor, engine, cloaking, tractor beam, transporters and various advanced weapon systems. Track your ship's AI crew as they go about their on-board duties which include engaging hostile intruders, repairing ship systems, prepping support craft etc. Lead your marines into battle on planets using various weapons of mass destruction. Deploy an away team of (e.g. marines, engineers etc) in a shuttle, deploy them on various planetside missions; complete with advanced orders. Deploy probes to keep track of friendly regions as well as spy on hostile ones. Deploy mining drones on planets to mine for precious minerals which you can then sell for profit. Dock at various space stations and planetary bases to trade, repair, rearm - and of course engage the hostile ones along the way. Play the freeform scenario and roam a large persistent galaxy. No shuttles? Don't want to risk being shot down? Use the transporter room to deploy your combat away team directly into hostile planets. There is no multiplayer in this version of the game. There are no more updates to the base game. The final version was v2.00.03 released on 05-28-2015. You can view the 2.0 changelog for more info. Due to the game being improved upon, future updates are only released via The Lyrius Conflict DLC which uses v3.x game engine kernel. You can view the 3.0 changelog for more info.